At first I found it odd that DNA11 would include "molecular rulers" in its larger DNA portraits, because those aren't actually from the subject's DNA--they're a lab product. That means your mini-portrait is actually more "you" than a larger DNA11 portrait would be. It appears that they leave the rulers out of the mini-portrait. This made me curious: do all DNA art companies include their own molecular ladders as outside lanes in the images they produce? I researched for a half-hour. The only company I found that didn't do this was Signature DNA. They emphasize that it's all you, and the images on their site clearly show that they're not adding molecular rulers to beef up the image. That seems right. The whole idea of DNA art is that it's uniquely you, your DNA, nobody else's. I don't get why so many of these companies put their lab-constructed molecular rulers into the image. It's like getting your portrait taken and having the photographer's assistant stick his head into the frame. Yes, you're a handsome chap, but this is supposed to be a picture of me! Jasph said "It appears that they leave the rulers out of the mini-portrait." Actually they do have rulers - look at the outer lanes of my mini-portrait, they are identical ruler lanes, and DNA11 has told me in email that they only have four lanes of different RAPD primers, and there are six lanes on the mini-portrait. 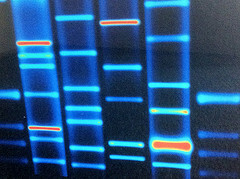 I like the rulers myself, as that is what you would find on an actual DNA profile gel. Are the same primers used for every DNA portrait? Or are more than those listed primers used and the best performing primers are chosen for the picture? Does anybody know which exact DNA ladders they use (supplier, product name)? Does anybody know the PCR program they use? My impression is that the same DNA primers are used in every DNA11 portrait, but DNA11 says they move them around so you don't know which one is which. I don't know what the reverse primers are. DNA11 appears to be willing to answer questions (slowly) if you contact them.